Mads Østberg and Jonas Andersson have inherited their first World Rally Championship (WRC) win at the Vodafone Rally de Portugal following the eleventh-hour exclusion of provisional rally victors, Mikko Hirvonen and Jarmo Lehtinen. Last weekend’s rally proved to be one of the most eventful for decades. 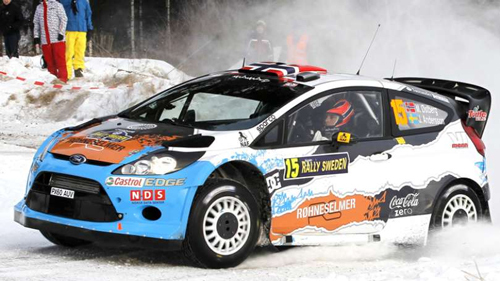 Whilst none of the four leading manufacturer-entered drivers were classified at the end of the event, Østberg thrived behind the wheel of his Ford Fiesta RS WRC in the tricky conditions. Keeping his composure throughout the four days of competition, the young Norwegian excelled where the more experienced faltered to claim the first WRC victory for a privateer since 1993. The decision also promotes M-Sport Ford World Rally Team’s Evgeny Novikov and Denis Giraudet to second overall. With a sensational drive in their ALM Russia and ALM Rally.ru supported Ford Fiesta RS WRC, the youngster overcame a multitude of issues – including late dramas with a broken throttle pedal over the final loop – to claim the first ever podium for a Russian driver in the WRC. Coming into his own over the course of this season, Novikov’s second place demonstrates his potential as one of the WRC’s most gifted young talents. Hirvonen was excluded following a report from the FIA technical delegate late Sunday night which stated his car’s clutch did not comply with the regulations. The report also stated that the turbine wheel in the car’s turbocharger exceeded the authorised diameter, but a decision on this has been postponed to allow further examinations. Citroen Total World Rally Team has appealed the exclusion with the results remaining provisional for a further seven days. Despite missing the first round of the season, Østberg now lies third in the drivers’ standings, just nine points adrift of factory Ford driver Petter Solberg in second, and 13 from the lead. Novikov remains fifth, but extends his lead over Jari-Matti Latvala to 11 points. “Of course we are very happy with the win, but it is not the way we wanted to take it and I am very disappointed for Mikko [Hirvonen] as he did a fantastic job all weekend. “But we had a really good rally ourselves and we will definitely be celebrating our ‘second’ place. Our pace was good and I felt as though we were always in control. “I was so happy to have achieved my first podium, and now to discover it is second place, it is the maximum we could have hoped for. Obviously I am very sorry for Mikko [Hirvonen] as he had a very good rally.